To loosely paraphrase Benjamin Disraeli: In a progressive [city] change is constant; …change… is inevitable. 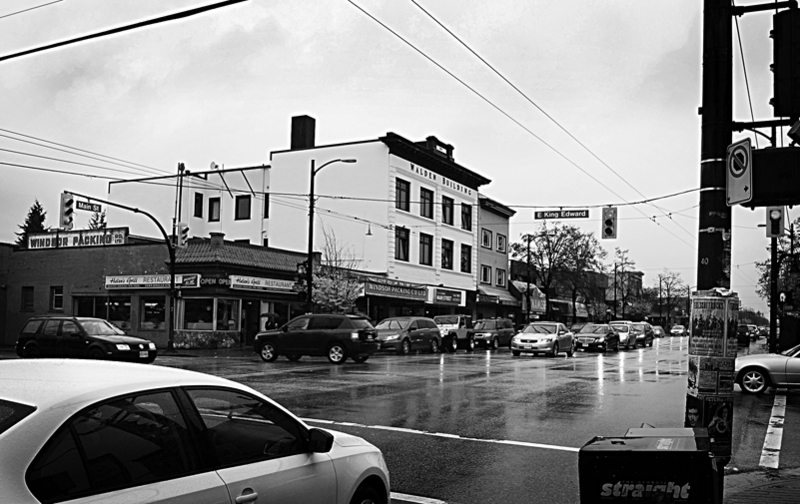 Vancouver is a city that most inevitably is constantly changing … sometimes for the better and sometimes for the worse. But, how much has the city really changed? Sometimes it can be hard to tell unless you can directly compare the past with the present. Primary source documents like visual historical records, whether they are still or moving images, capture a moment in time and allow us to compare the past with the present. I think it is really interesting to look back and compare how much (or, how little) a place has changed over the years. 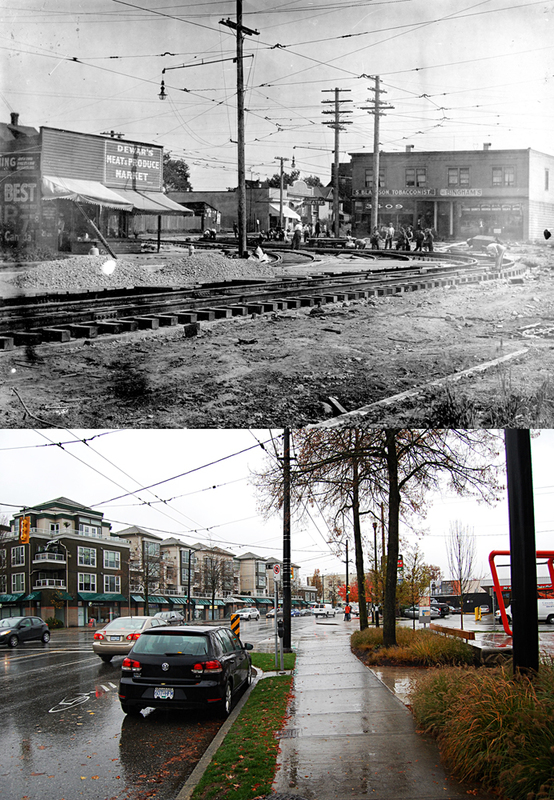 So, inspired by photographer Dan Toulgoet’s “Then and Now” series in the Vancouver Courier and the blog of ‘then and now’ images Changing Vancouver , I decided to try my hand at creating my own comparative pairs of ‘before and after’ images. The City of Vancouver Archives’ photographic holdings contain about 1.5 million images, so I really had to focus my search. Since Main Street is one of the central historic streets in Vancouver, I decided to start there. I found three images along Main Street that were within 10 blocks of each other in the South Main (or SOMA) part of Main Street. The first two images were fairly straight forward, in that they each featured a historic building that is still standing today, providing an excellent point of reference for my after images. The third image was less straight forward. I had to make a calculated guess at the perspective of my after photo, which proved to be rather difficult, but more about that later. Before: Corner of 25th Ave. and Main St. Vancouver, B.C., [1912?]. Image from original b&w glass negative; 13 x 18 cm. 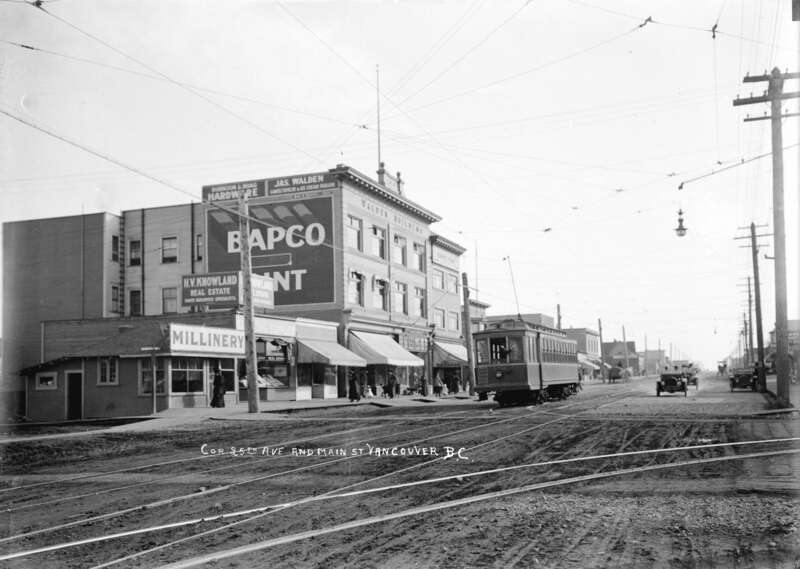 Photograph shows the Walden Block at 4112 Main Street, streetcar and automobiles on Main Street in South Vancouver. Photo: City of Vancouver Archives SGN-1021. This photograph from the Vancouver Archives, dated ca. 1912, shows the intersection and SE corner of Main Street at King Edward Ave (formerly 25th Ave). It features the three story Walden Building, built in 1910. My after photograph also features the Walden Building, with it’s recently painted black and white facade. 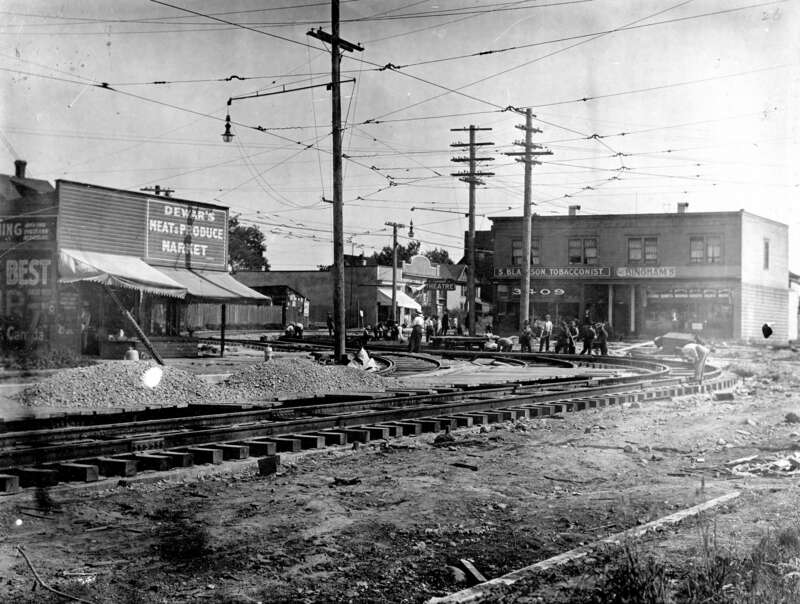 It is interesting to note that a spider web of overhead wires feature prominently in both images despite the difference of 101 years. I find that, despite the significant passage of time between the two images, there is a certain sense of continuity and cohesiveness between them. The next image was probably the most straightforward scene to recreate among the three historic photos. Before: South Vancouver Post Office [Postal Station C, 3100 Main Street and 15th Avenue East] , 1917. Image from original b&w glass negative; 11 x 16 cm . Building is now known as Heritage Hall, 3102 Main Street. Stuart Thomson, photographer. Photo: City of Vancouver Archives, CVA-356. 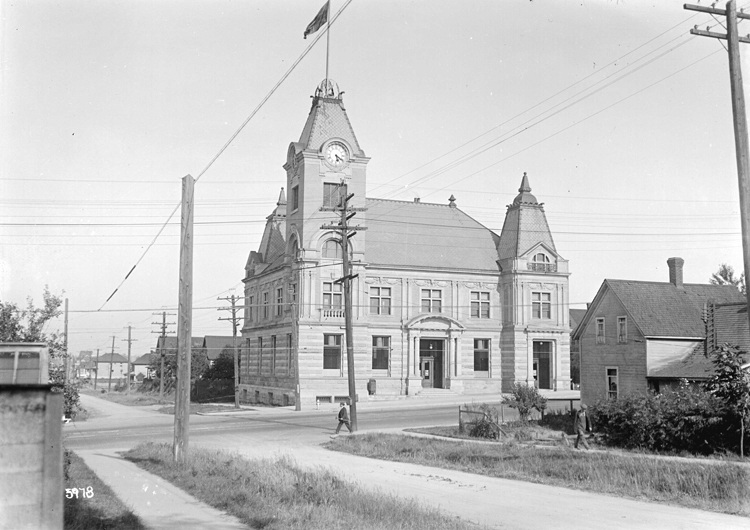 This 1917 photograph features the South Vancouver Post Office (1916), 3100 Main Street at East 15th Avenue (now known as Heritage Hall). After the post office vacated the premises, the building operated as the Dominion Agriculture Building from 1922 until 1962. Then from 1965 to 1976 the building was occupied by a special investigation branch of the RCMP. 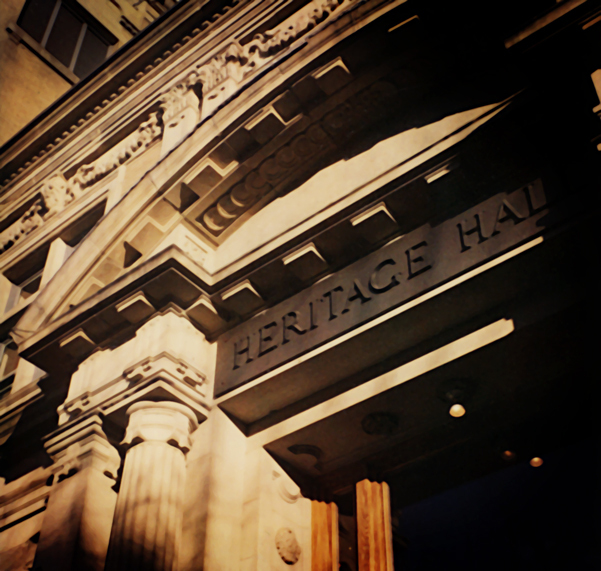 In 1974 the building was designated a heritage structure by the City of Vancouver, and by Public Works Canada in 1976. The building was then vacant for several years and fell into disrepair. 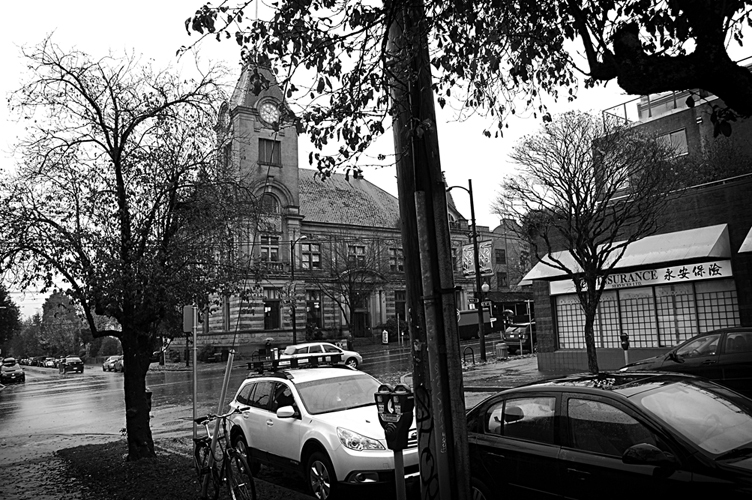 In 1982 a non-profit group saved the heritage building as a community and cultural centre and it opened as Heritage Hall in 1983. After: Heritage Hall, 3102 Main Street at 15th. 2013. Photo: C. Hagemoen. The angle is not quite right in this ‘after’ image and there is a lot of boulevard clutter (trees, meter, utility pole) blocking the view, but you get the general idea. Also, if I had been able to use a large format view camera (like ‘before’ image photographer Stuart Thomson), with it’s ability to ‘shift’ and ’tilt’, to take my ‘after’ image instead of my digital SLR camera, I would have been able to recreate the parallel lines of the buildings, making for a more accurate rendition of the scene. It is worth mentioning at this point, that I did not bring a copy of the historical ‘before’ photograph with me when I went out to re-create these images. I decided to try and figure out my camera position prior to my shoot day. For the first two shots, this plan worked out pretty well. All though, in hindsight, both images could have been much improved if I had brought a copy of the ‘before’ image with me. The third, and final, ‘before’ image was the hardest to recreate. It took me a long time to figure out what portion of ‘Main and 18th’ I was looking at. Unlike in the previous photographs, there wasn’t an existing iconic building like Heritage Hall or the Walden Building to orient myself from. I had to use VPL’s online city directories to try and pin point an address for at least one of the businesses featured in the original ‘before’ image. The exact date for the photo above is not known, so this made searching through the directories more time consuming, as I was often checking several directories for the same listing. I started my search with what I thought would be the most obvious choice, Dewar’s Meat & Produce. However, after checking directories from 1911 through 1923 I could not find a listing for Dewar’s. There were many listings for the last name of Dewar, but none of those listings related to this business on Main St. or 18th Avenue. I then decided to try my luck with S. Blackson and Binghams’ and again, the same result. No conclusive connection to the location in the photograph could be established. I was about to give up hope when I tried searching for the Fairmont Theatre. Finally, I had a match! The Fairmont Theatre first appears in the 1913 directory at ‘3424 Main Street’. This would place it somewhere in the middle of the condo development in the ‘after’ image above. Apparently the theatre did not survive the war years, as it is listed as ‘closed’ in the 1918 directory. The Fairmont was included in the directory listings as ‘closed’ until 1923. A listing for the Fairmont Theatre does not appear in the 1924 directory. I needed to figure out more about this image. After staring at the high-res version of the ‘before’ image for a while, trying to find more clues, I noticed a name on the top of the building on the right. It appeared to read: ‘Hanna Block’. So, I looked under the “Blocks, Buildings and Apartments” section in the city directories to see if I could find it. I found a listing for a ‘Hanna Block’ in both the 1918, and 1919 directories, but the address was at ‘4403 Main Street’ – ten blocks away from 18th and Main! Researching this photograph kept getting more and more complicated, but I persevered. Finally, in the 1922 city directory I found a listing for another ‘Hanna Block’ at ‘3407 Main Street’ [In total there were three listings for ‘Hanna Block’ in 1922 – who was this ‘Hanna’?]. In the ‘before’ photograph the address ‘3409’ appears on the side of the Hanna Block, most likely indicating the address of the tobacconist’s shop. Curiously, in the 1923 city directory, the address for the Hanna Block changes to ‘3425 Main’ and then changes again in 1925 to ‘3415’. These changes might indicate some sort of development in the area – perhaps the laying of street rail tracks? In the 1926 directory, the listing for the ‘Hanna Block’ (in the ‘3400’ block of Main Street) disappears. Does this really mean that this building only lasted 5 years? Hmmm, a bit of a mystery. Trying to incorporate all the elements of the ‘before’ image, I created the ‘after’ image above – which is actually three separate images of the area (clumsily) stitched together. I figured that the restaurant on the left was roughly where Dewar’s once stood, the Fairmont Theatre was somewhere in the centre, and the Hanna Block would have been located in the right side of the scene, where a parking lot currently sits at Main and 18th. But, it still didn’t seem quite right. Notice in the old photo (top) there is a large ‘S’ curve in Main Street as it makes its way through where 18th Ave intersects. Today this curve is still visible, but is less extreme – more of a lazy bend than a distinctive curve. In the aerial photo/plan (below) notice how Main St. is slightly bent in that area, and that 18th Ave. does not match up on either side of Main St.
A City of Vancouver aerial photo indicating the area of the new park at 18th and Main (in red). My changes are indicated in orange and green. Image: City of Vancouver and Google. After spending a lot of time thinking about this [possibly too much time!]. 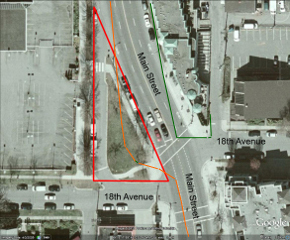 I think that the triangle piece of land (indicated in red) – today a park – was added many years ago to help straighten out the severity of the original ‘S’ curve along Main Street. This likely happened after the municipalities of Vancouver and South Vancouver amalgamated in 1929*. As I have indicated (in orange) on the plan, I believe that Main Street used to curve right through that piece of land. I also believe that the pointy corner at the east side of Main St at 18th was larger, and previously used to cover part of the roadway (indicated in green). This would mean that my vantage point for taking my ‘after’ image, should have been somewhere in the centre of that triangle. Which would have resulted in a truer depiction of the perspective of the scene. Main at 18th – Before and After. I think if my camera position was about 8 meters to the right, the angle would have been just about right. Top Photo: City of Vancouver Archives, A-16-27. Bottom Photo: C. Hagemoen. Considering all the information I gathered about this image, I would porbably date it much later than the 1910s, to around 1922 or 1923. Mainly due to the facts that one of the buildings featured ( the Hanna Block) does not appear until the 1922 directory, and that one of the businesses shown (the Fairmont Theatre) is no longer listed in the 1924 directory. It would also make more sense for an infrastructure project, such as this, to take place after the war (WW1 1914–1918), when raw materials and able men would have been more available. Since this was such an interesting and sometimes challenging exercise, I plan to try my hand at creating more pairs of ‘before and after’ images in the near future. So that I will be able to compare the more of Vancouver’s past with it’s present. Interested in seeing more about how much the city has changed? Check out “Through the Lens: Building Vancouver’s History” at the H.R. MacMillan Space Centre. This presentation, collaboration with the City of Vancouver Archives, offers a unique perspective on the changing city with an “indoor” digital walking tour which allows you to experience the changes that have enveloped the city over the last 100 years. The next screening at 7:00pm Wednesday, December 4, focuses on Kerrisdale, False Creek and Granville Island with historian and tour guide, Michael Kluckner. This was my corner growing up. I caught the streetcar to go down to12th to St.Pat’s for school. I lost my first tooth while buying an ice cream in the cafe on the corner. So glad to see these pics. Thanks for sharing your memories Dolores, I’m glad you enjoyed the look back.